Hello friends! 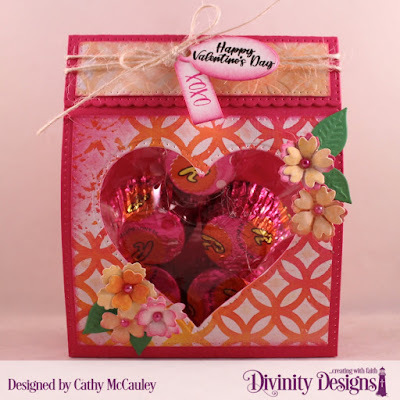 It's time for Throwback Thursday over at Divinity Designs and the feature for today is perfect for Valentine's Day, which will be here before you know it...the Ornate Hearts Dies. 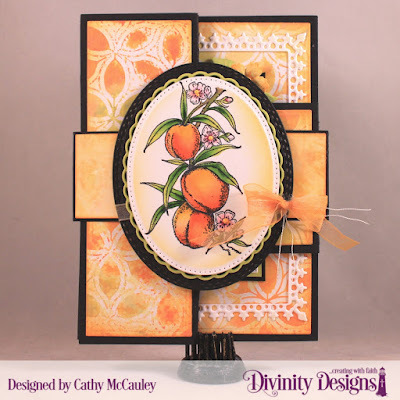 Creative Nugget: VersaMark Ink was sponged through the Circles Stencil onto Kraft card stock and embossed with white powder to create the frame. Distress Oxide inks were splattered onto a mixed media panel and Kraft ink was sponged through the Circles Stencil for the background. A border using Paper from the Shabby Rose Paper Pad was added to the card and the Ornate Hearts Dies were layered and attached to the border. 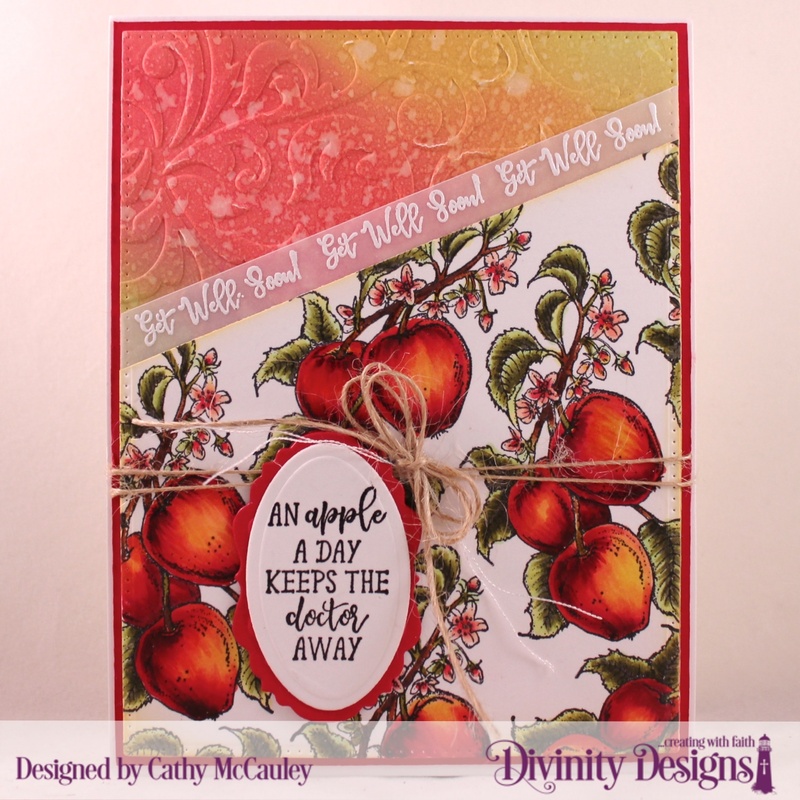 The sentiments from the Festive Favors Tag Sentiments were stamped on the tags cut with dies from the Festive Favors Die Set. A few sequins were added to finish the card. A matching favor was made using some of the left over pieces from the card above. 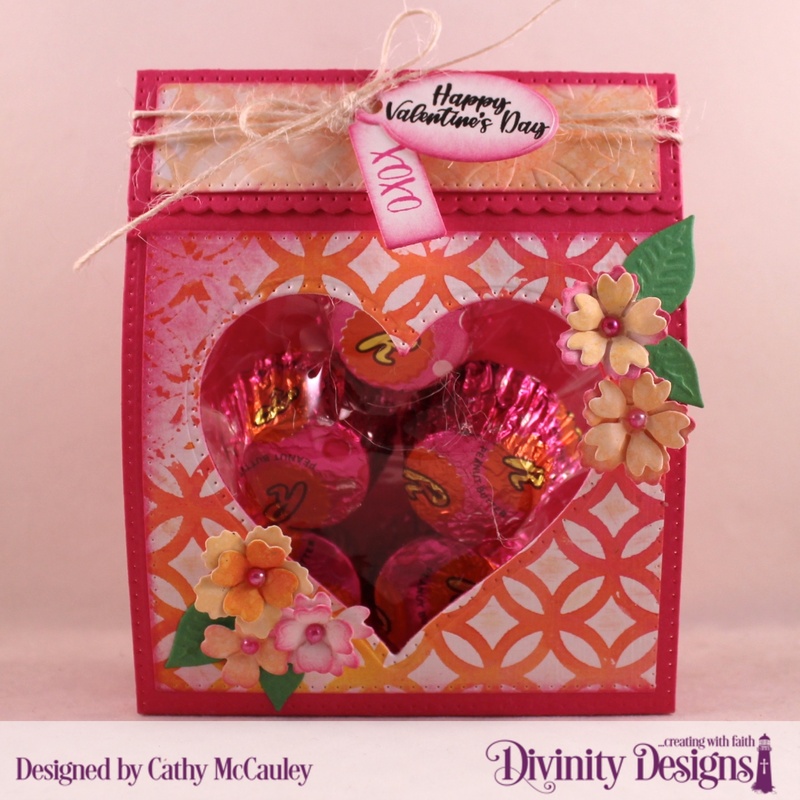 Festive Favors Dies and the Ornate Hearts Dies were used to create the little favor filled with Valentine candies. 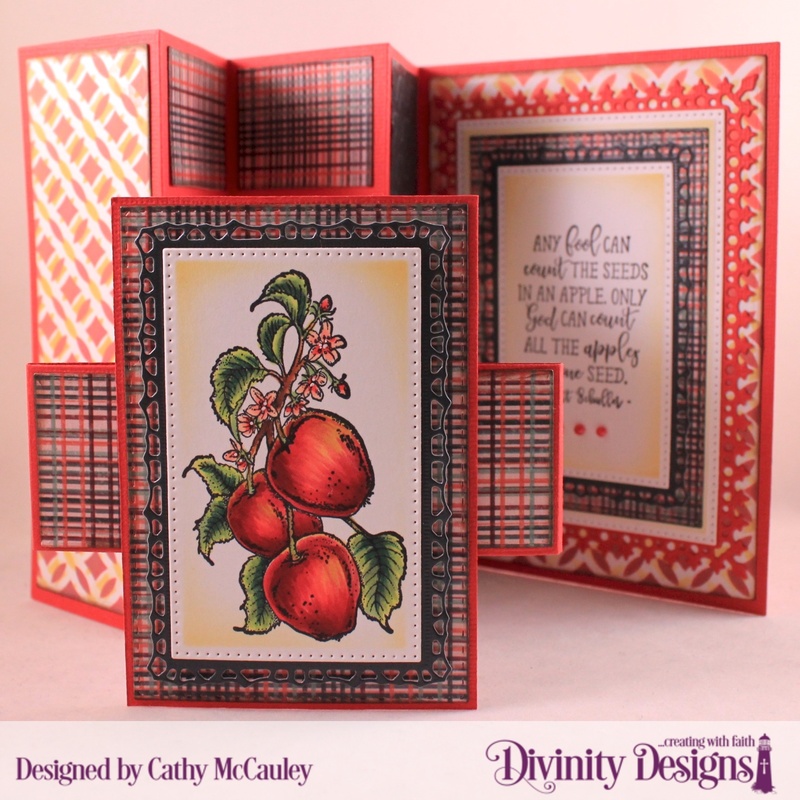 To see more samples using the Ornate Hearts Dies hop on over to the Divinity Designs Blog. Happy Saturday, everyone! 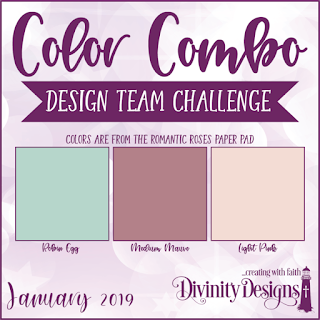 Divinity Designs has a new feature over on the Divinity Designs Blog today...it's a color challenge for the design team. We hope you will be inspired by the projects and the colors. I have chosen to use the In My Heart Stamp/Die Duo for my friendship sample. I just love the hydrangea image in this stamp set. Creative Nugget: The Quilted Background Die was used to cut coordinating papers from the Romantic Roses Paper Pad to create the background. 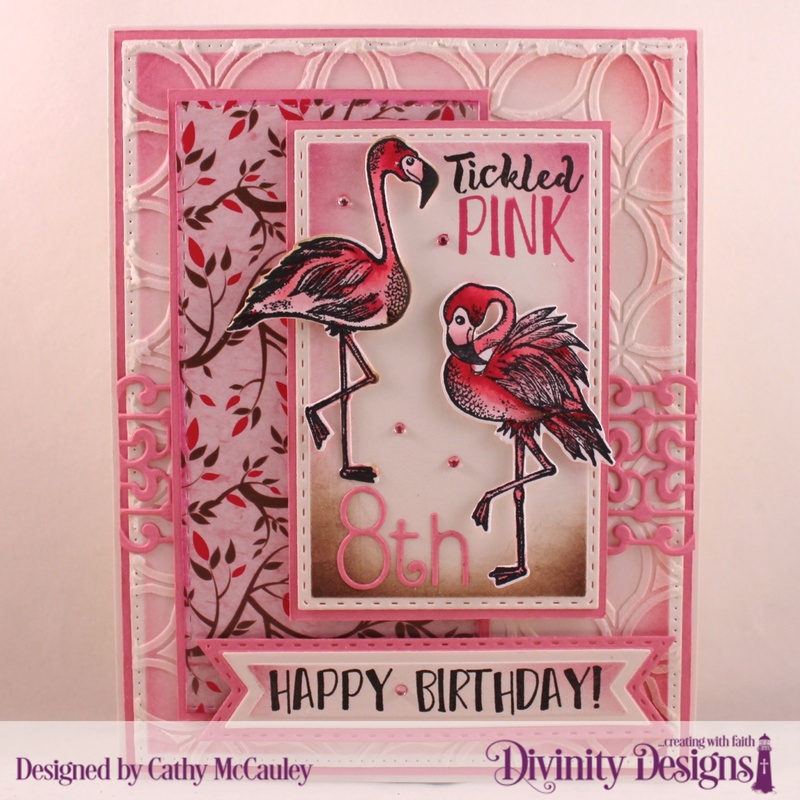 The new Flourishes Embossing Folder was used to impress texture onto the background and also onto the Large Banner. 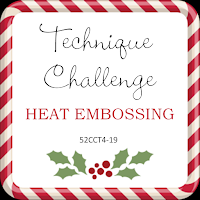 The sentiment was stamped on another Large Banner die cut. 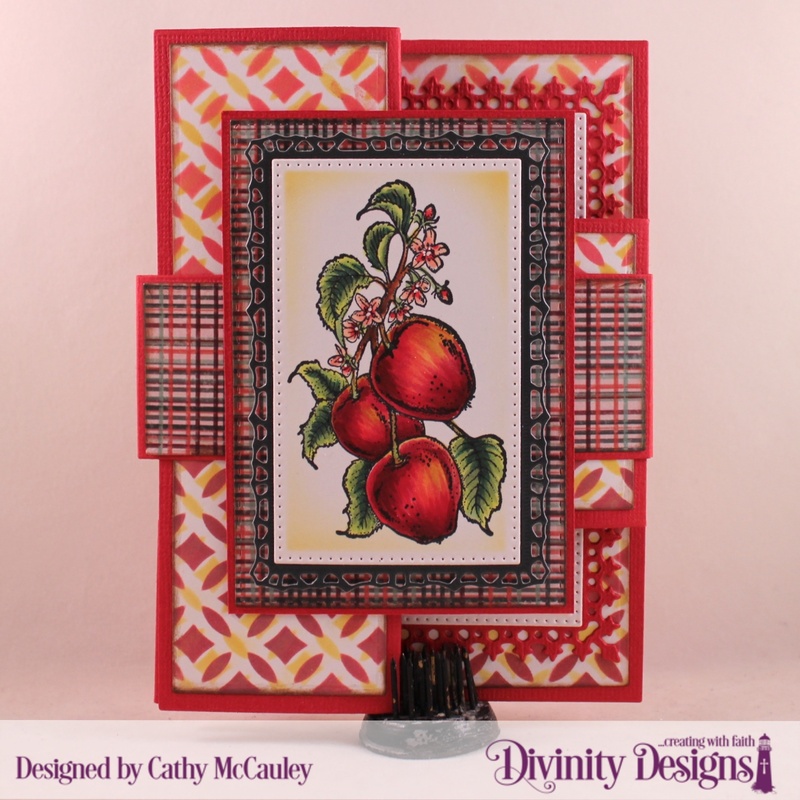 The Copic colored hydrangeas were cut with the coordinating die. 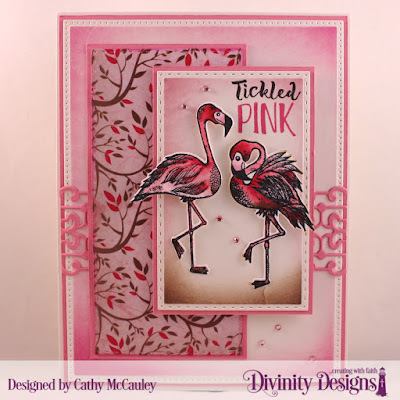 A border was cut and added behind the sentiment using the Bitty Borders Die and the Cloud Border Die. 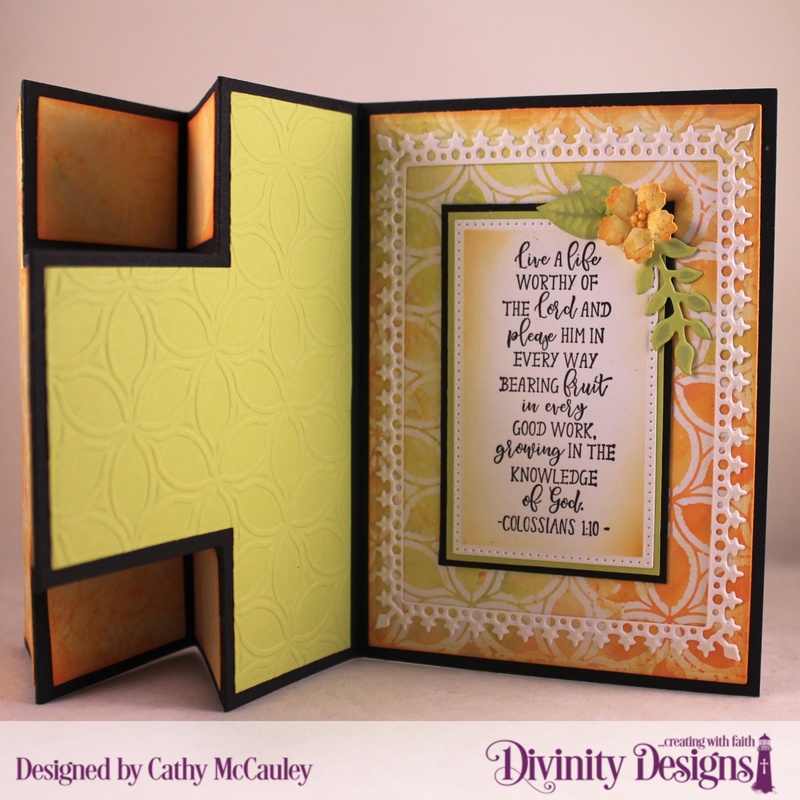 Nuvo Drops were added to the centers of the flower petals and to the sentiment panel to finish the card. Thanks so much for stopping by. 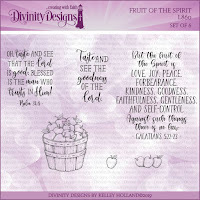 Be sure to hop on over to the Divinity Designs Blog to check out the other projects created by the Divinity Divas! Hello friends...Happy Friday! I have two cards that I'm sharing over on the Sweet 'n Sassy Stamps Blog today using the Llama Love and Filigree Hearts stamp sets. Creative Nugget: I decided to use this very cute and versatile stamp set to add to my stash of birthday cards. The mountain image from the Llama Love set was stamped repeatedly across the card and masked before sponging the sky and foreground with Oxide inks. 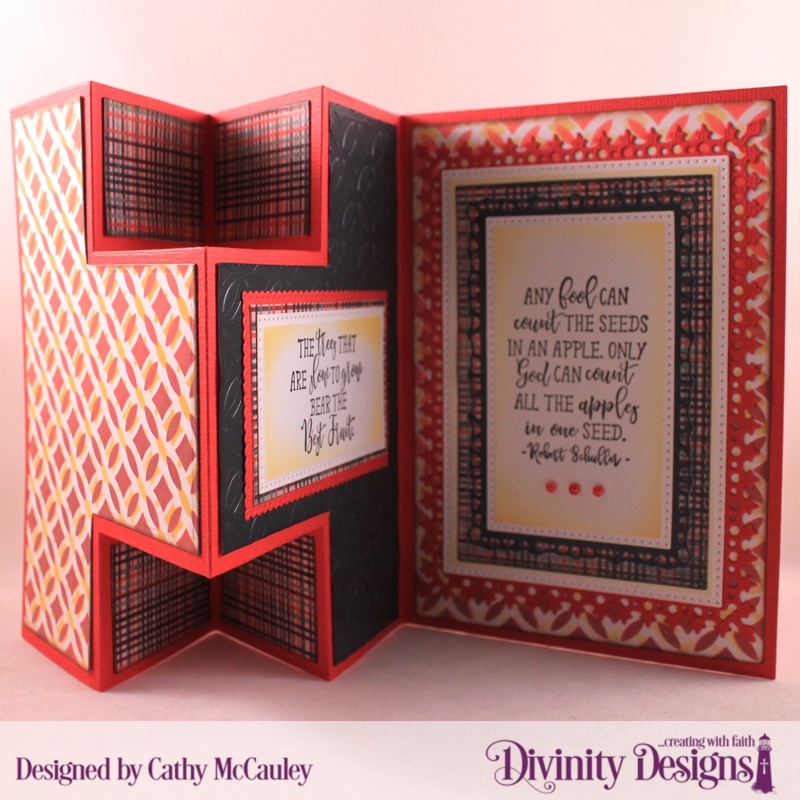 A heart was cut from the center of the card using a Spellbinders Die. The mountains and all of the images were colored with Copic Markers. 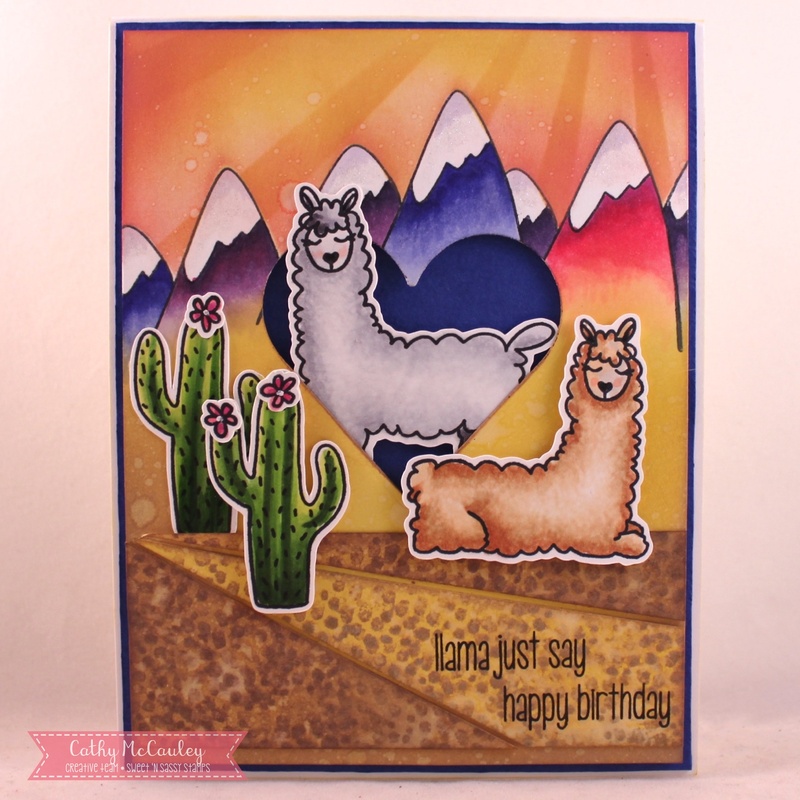 The llamas and cacti were cut out and popped onto the card. A few little flowers were added to the cacti to finish the card. 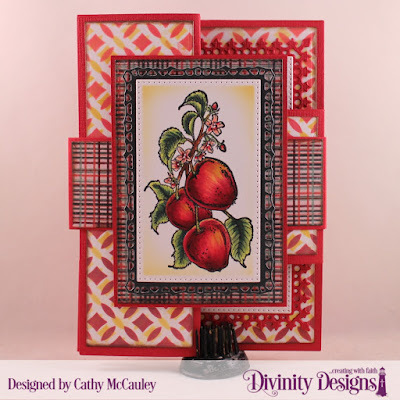 Creative Nugget: Filigree Hearts is the January Stamp of the Month and is free with a $75 dollar purchase from the Sweet 'n Sassy Stamps Store until the end of the month. Several of the heart images were white embossed on a mixed media panel. Purple and Pink Oxide Inks were then sponged and spritzed with water to create this kind of 70's retro look background. 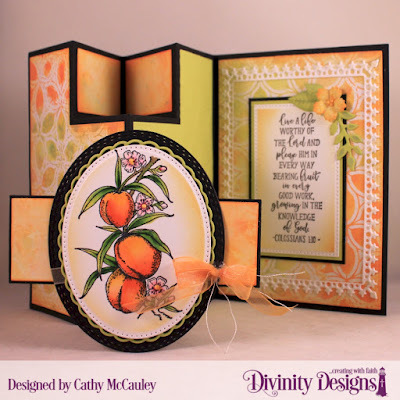 The panel was cut diagonally and the sentiment stamped using the Sunshine Girl Alpha was inserted. 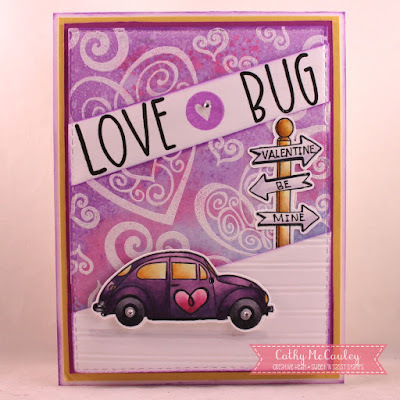 The little VW Bug image from the Go God's Way perfectly fit the style of the card. The words on the signpost were hand lettered. A few bitty sparkles were added to finish the card. 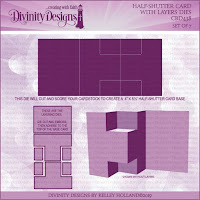 This card will be given on Valentine's Day to a special little girl at my church who loves purple and pink!! 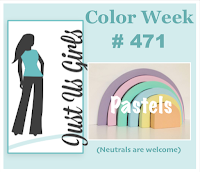 Cute Card Thursday Challenge 565 - Banish the Blues! Thanks so much for stopping by...have a blessed weekend! Good morning, friends! Today we are taking another look at the Divinity Designs January 2019 Release. 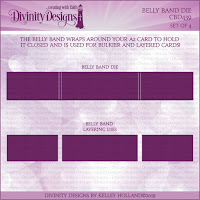 Some of the new product were used to make a half-shutter card and a couple of favors perfect to give as little gifts. My first sample use the new Apple Branch stamp set, the Half-Shutter Card with Layers Dies and the Circles Stencil. Creative Nugget: Different shades of red Oxide inks were sponged through the Circles Stencil on mixed media paper. The stencil was then cleaned off and shifted over to the right and down a little before adding Fossilized Amber ink. These panels were then used for the layers on the card base. Copic Markers were used to color the Apple Branch. Papers from the Christmas Collection 2017 were used on the Belly Band and for some of the layers. Pierced Rectangle Dies and Lavish Layers Dies were used to cut some of the layers. 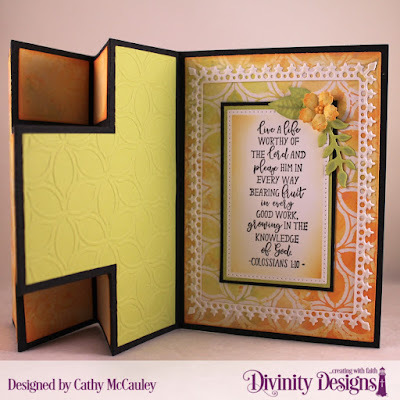 The same dies were used to cut the layers for the sentiments on the inside of the card. 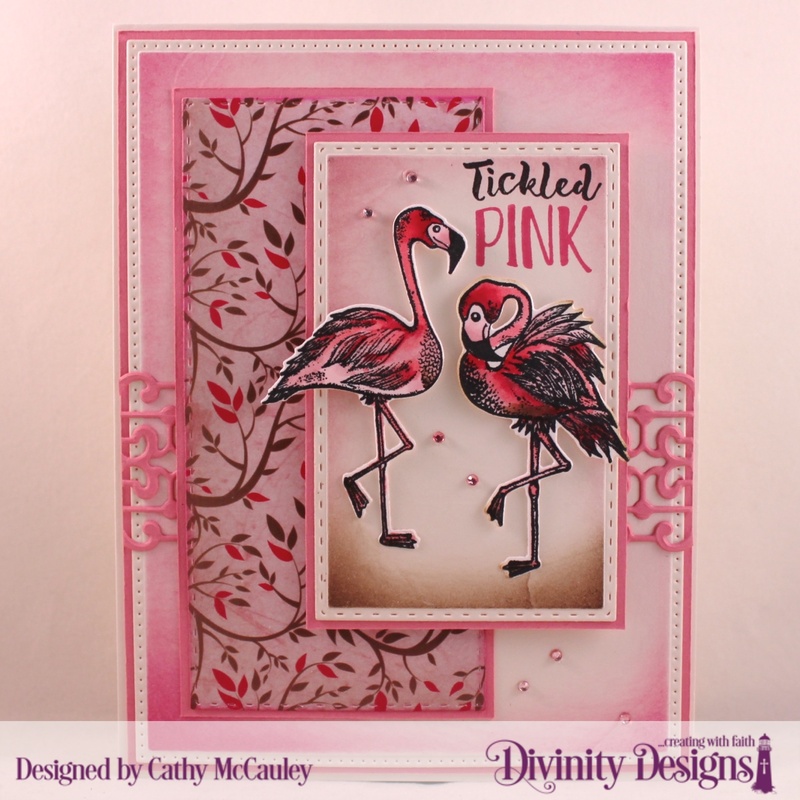 I had fun matching the colors, papers and stenciled panels for my card! The new Festive Favor Dies were used to create a couple of little gifts for some special friends. 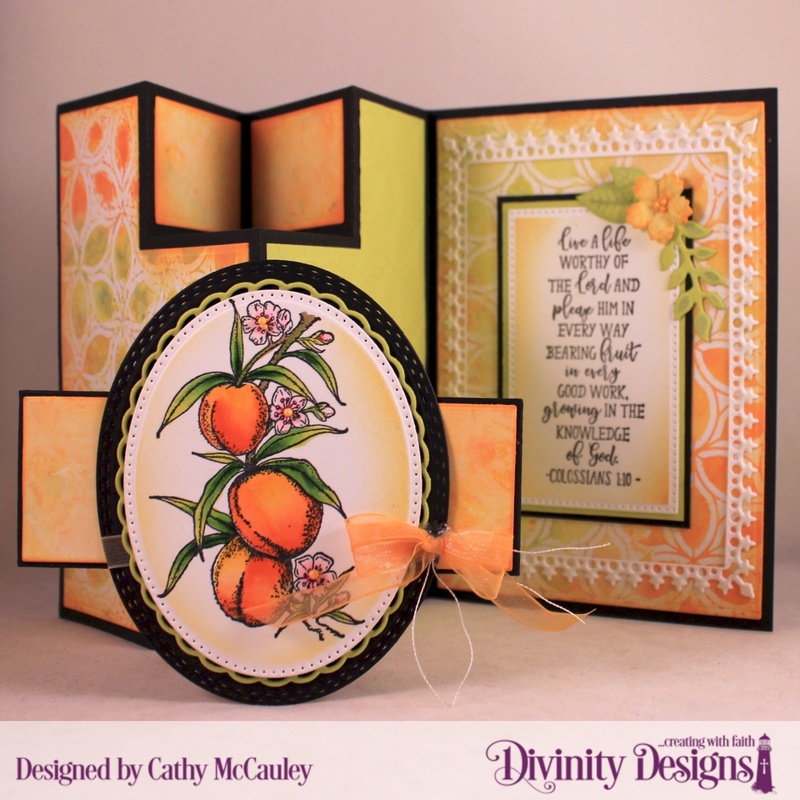 Creative Nugget: Mixed media panels created with the Circle Stencil and Oxide inks were cut down and sized using Pierced Rectangle Dies. The stencil was then used to emboss the layer on the flap. The flowers and leaves were cut from scraps and pearls colored with a Copic Marker were added to the centers of the flowers. 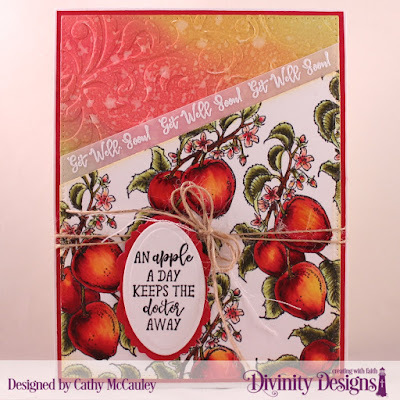 The sentiments from the Festive Favor Tag Sentiments Stamp Set were stamped on the little tags and tied onto the favor with twine. 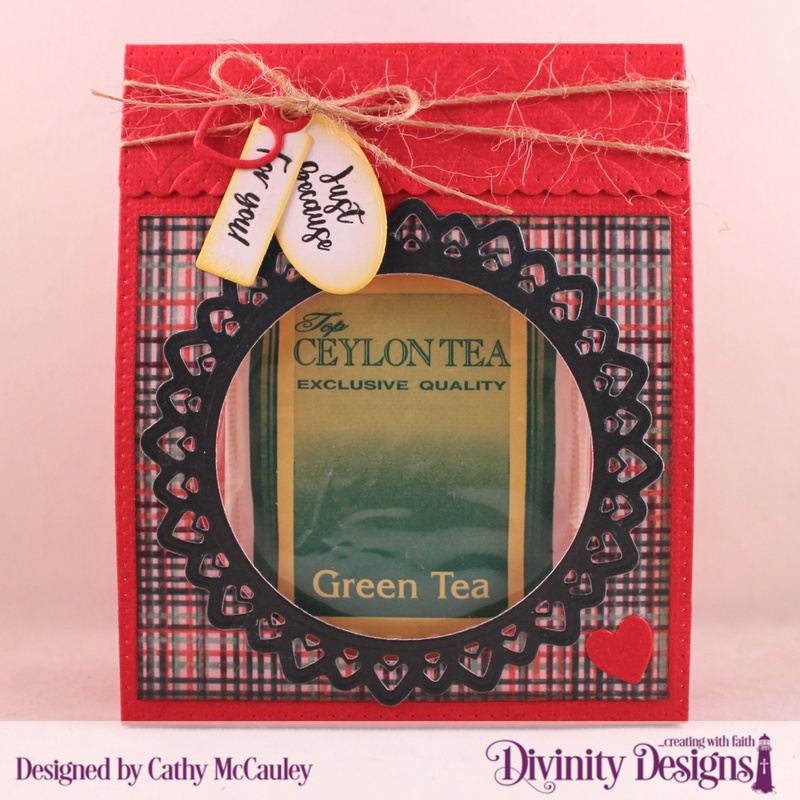 Creative Nugget: My second Festive Favor was made much the same way except paper from the Christmas Collection 2017 Paper Pad was used and a frame around the opening was cut with a Filigree Circle Die and a Circle Die. The Circle Stencil was again used to emboss the flap. 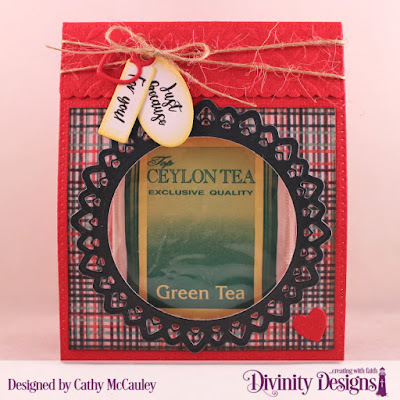 I love all the little dies included with the Festive Favor Dies that can be used to decorate these fun little favors perfect for gifts throughout the year. 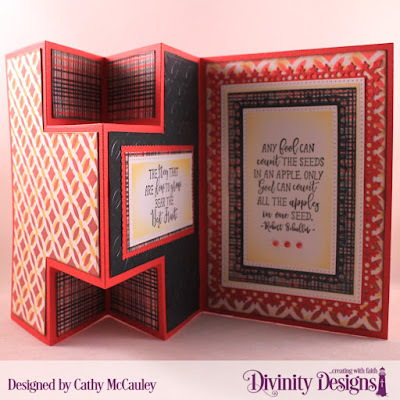 Be sure to check out the Divinity Designs Blog to see more beautiful samples created by the Divinity Divas using products from the January Release! Hello friends! 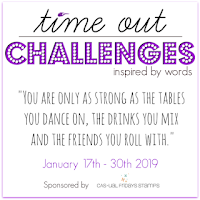 It's hard to believe that 2019 has arrived (where did 2018 go? )...hope you all had a fantastic New Year's Day! 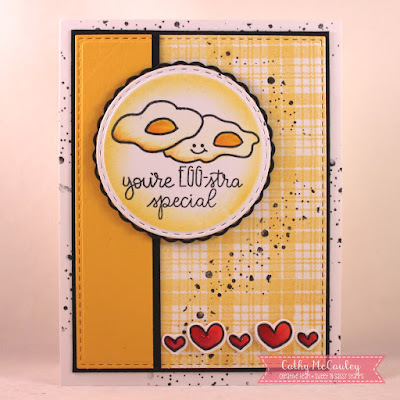 I've been having so much fun with the new Punny Love Stamp Set just released by Sweet 'n Sassy Stamps. Once you start playing with this set, it's hard to stop so I have four cards to share with you today that I am also sharing over on the Sweet 'n Sassy Stamps Blog. Creative Nugget: The hearts from the Grunge Elements 2 set were white embossed on a piece of heavy mixed media paper and the panel was smooshed over watered down Oxide Inks on my craft mat. 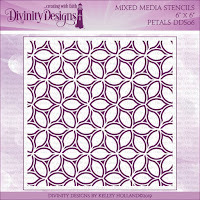 The grid from the Texture Tiles 1 stamp set was then stamped over the panel for added texture. The donut image was colored with Copic Markers and Glossy Accents applied over the icing. A few sequins were added to finish the card. 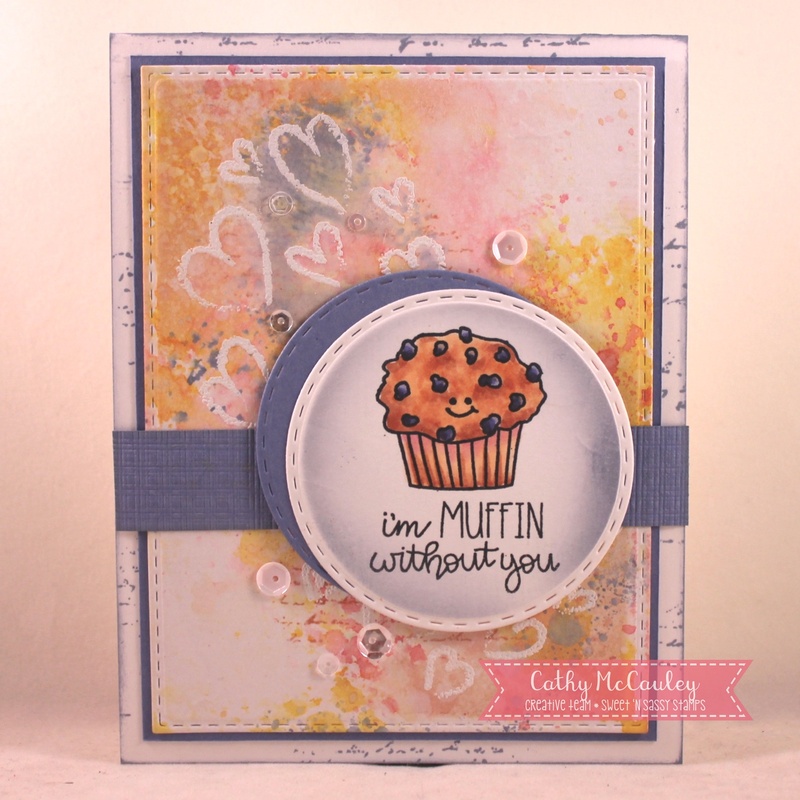 Creative Nugget: The muffin card was made the same way except the script stamp from Texture Tiles 1 was used instead of the grid. Creative Nugget: The third card is very clean and simple. 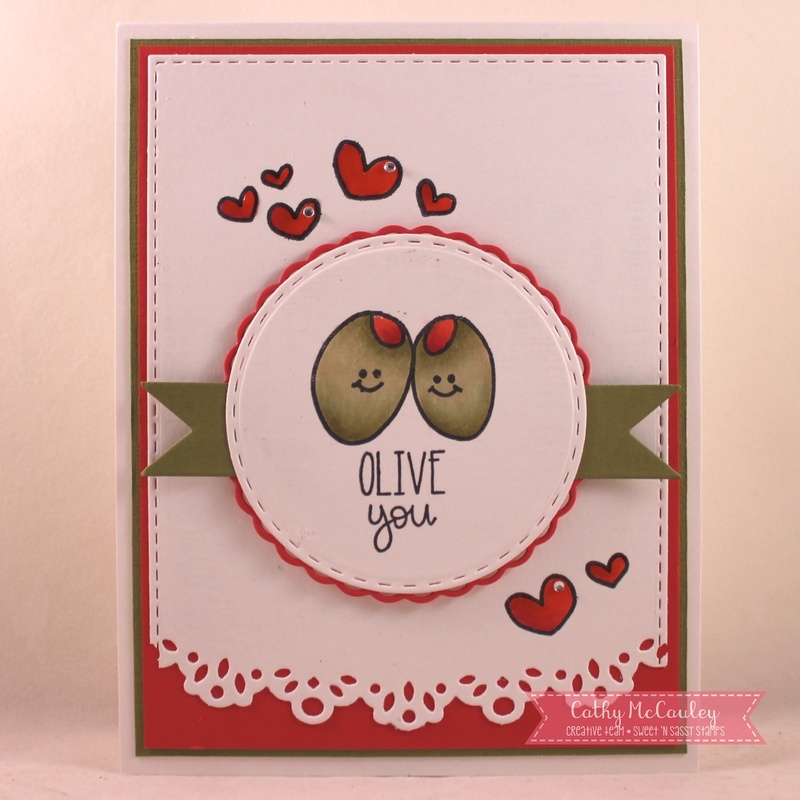 All images were colored with Copic Markers and Glossy Accents was added to the hearts. 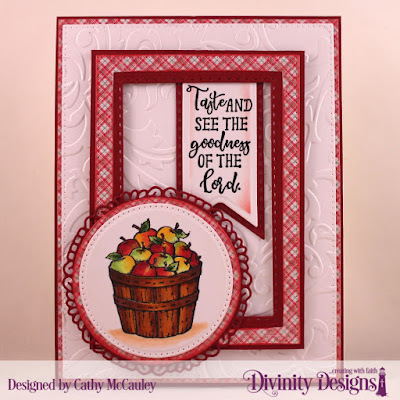 Creative Nugget: The plaid background on the fourth card was made using one of the plaids from the Texture Tiles 4 Stamp Set. 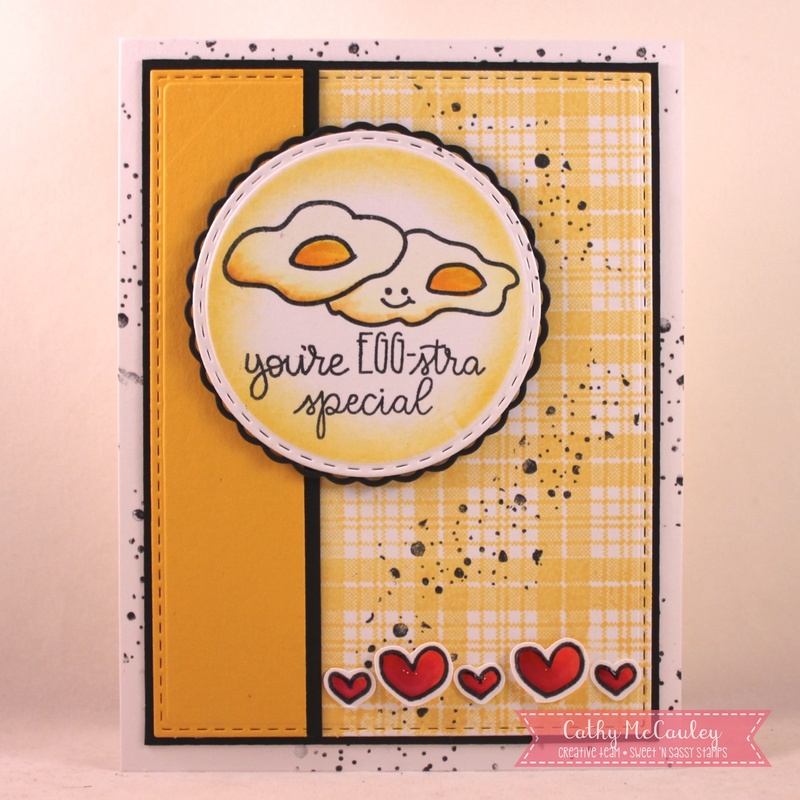 Of Course eggs...even EGG-stra special ones need salt and pepper so the splatter from Texture Tiles 1 was used to sprinkle the card. Glossy Accents was again used on the row of hearts. 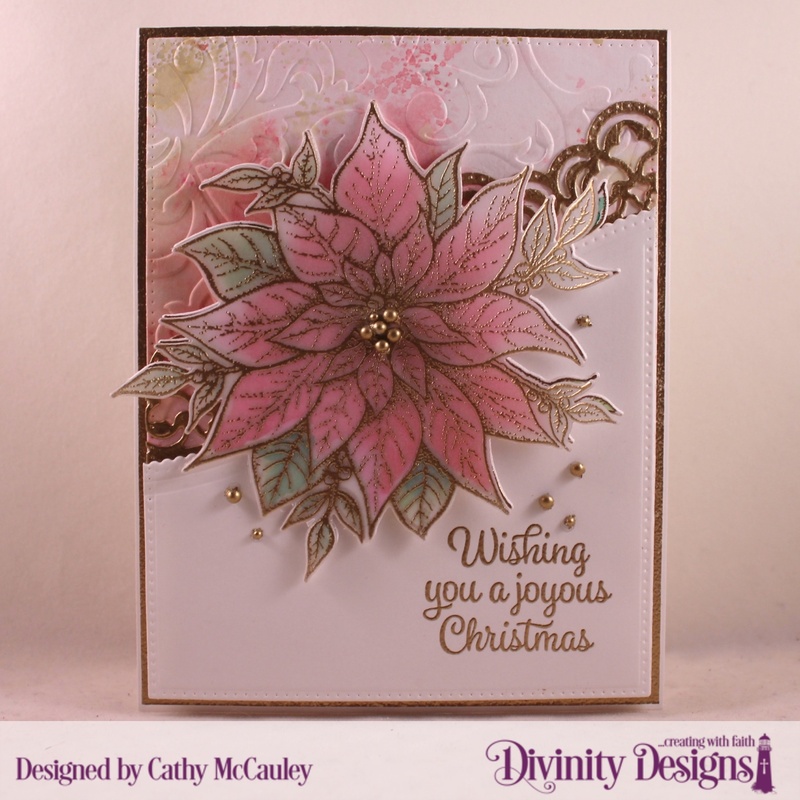 Thanks so much for stopping by...Happy stamping in the new year!